QUEZON CITY— ANGKLA Party-List, through Congressman Jesulito A. Manalo, took the lead in fulfilling the long time plan of building a MARINA Regional Processing Center in the Negros Island Region. 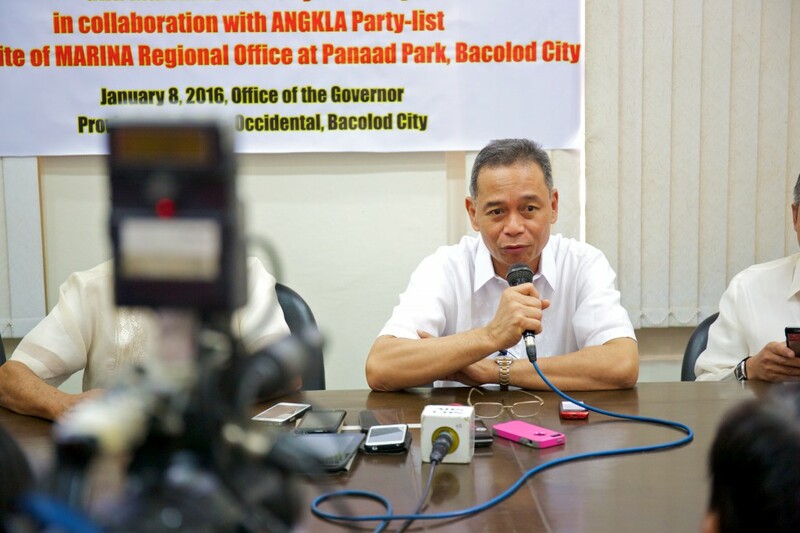 On 8 January 2016, Friday, Administrator Maximo Q. Mejia, Jr. and Governor Alfredo G. Marañon, Jr., formally executed an Agreement, marking the initiatory steps towards the construction of the Marina Regional Processing Center in Panaad Park and Stadium in Barangay Mansilingan, Bacolod City. Present to witness the ceremonial signing were ANGKLA Representative Jess Manalo and Negros Occidental Second District Representative Leo Rafael Cueva. Rep. Manalo was at the forefront in bridging the Province of Negros Occidental and MARINA to come to terms in identifying the location of the regional center, and in successfully securing the needed P60-M fund now allotted to the Department of Public Works and Highways under the 2016 national budget, specifically for the construction of the processing center. The sole representative of the maritime sector in Congress aims to facilitate the process of securing certification requirements to assist and unburden seafarers all over the nation and firmly believes decentralization is key. During the signing ceremony, ANGKLA, equipped with relevant statistical data, boasted not only of the number of Negrense, other Visayan seafarers, and allied ancillary service providers to benefit from the new center, but also stressed the optimum potential it ushers in to catalyze the region into becoming one of the leading maritime hubs in the country. “Aspiring Filipino seafarers, especially those from poor families in the Visayas must not be deprived of government assistance in terms of processing the needed documentations and certifications. We must bring government closer to the people,” Manalo stressed. The “Usufruct Agreement” allows MARINA to utilize a 2,000 square meter parcel of land owned by the Province of Negros Occidental for MARINA to construct and house one of its one-stop regional processing centers. “This occasion marks the realization of the government’s and ANGKLA’s shared vision of providing the most basic needs of the Filipino seafarers in Negros,” Manalo said stressing ANGKLA’s mission to provide as much as possible, directly available and better services to all Filipino seafarers, helping them save a lot of time, energy, and money in securing their documentations. “This is a way of giving back to the Filipino seafarers who continuously work hard to contribute to the nation’s socio economic development,” he added. It is also the fulfillment of the common objective of ANGKLA and Marina of having a one-stop shop processing center in Negros, promoting the province to become one of the major maritime hubs in the country, Manalo declared. “This is part of an expected series of inaugurations of MARINA regional processing centers all over the Philippines. Last December 23, 2015, the Memorandum of Agreement, which paved the way for the construction of the Marina Regional Processing Center in Cebu, was also signed.” Manalo said. Manalo stressed ANGKLA’s mission to provide as much as possible, directly available and better services to all Filipino seafarers, helping them save a lot of time, energy, and money in securing their documentations. “These initiatives are simple ways of returning back the substantial economic contributions the Filipino seafarers have provided the nation in terms of billions of dollars in annual remittances.” Manalo said.